Is there anything to say in favour of these things? Not only insanely expensive and utterly pointless at every level, they pose a mortal danger to both man and beast. In the 20 years or so since they’ve spun into heavily subsidised ‘action’, the wind industry’s has managed to clock up a fairly sizeable death count: running at over 160 (so far), which includes the 4 killed (pilot and passengers) when the plane above slammed into a turbine in foggy conditions in South Dakota in April 2014. There are at least 2 critical dangers for flyers created by these things: 1) air turbulence – generated by a sea of 50-60m blades with their outer tips travelling at around 350km/h – interfering with the ability of the pilot to control their kite (see our post here); and 2) slamming into them – with reasonably predictable results. Whilst on descent to my operating airstrip near Biala NSW, I suddenly experienced severe turbulence at about 500-600ft AGL. The wind at this time had been approx. 5-8 knots from the SE. After landing I ascertained that there was only a slight breeze at ground level. I suspected that the turbulence was caused by the wind turbines at the Gunning Wind Farm but was amazed that the effect could be felt 9kms away. After the next take-off I confirmed that the turbulence was indeed caused by the turbines. There are many fixed wing & helicopter aircraft which operate at or below 500 ft AGL legitimately from hundreds of airfields around Australia. CASA & the Dept. 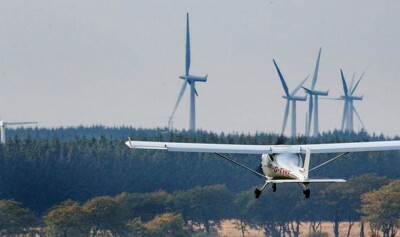 of Infrastructure & Transport have released a study, the National Airports Safeguarding Framework Guidelines D (Wind Turbines) to protect major airports, but it should be apparent that the greater threat to air safety from wind turbine turbulence lies around country airports, both public & private, which threat CASA & the Dept of Infrastructure & Transport have glossed over or ignored. In a sign that Ontario’s political betters are surely deluded (as wind cultists tend to be), logical arguments about the mortal danger posed to flyers by 160m turbines (with blade-tips clocking speeds equal Formula 1 Race Cars, creating turbulence that travels for a dozen kilometres) have been dismissed. Wholly unnecessary carnage will follow, as night follows day. Here’s three local takes on the unfolding and avoidable disaster. TORONTO — Opponents of a wind power project in the Collingwood area warned Thursday that it will put lives at risk because giant industrial turbines will be built less than four kilometres from an airport runway. Three local municipalities, residents and a pilots’ association say they don’t want eight 50-storey-tall wind turbines so close to the Collingwood airport and the nearby Clearview Aerodrome. “The province is knowingly approving turbines that are a hazard,” said Kevin Elwood of the Canadian Owner and Pilots Association. The wind turbines will be “jammed” between the two airports, which operate mainly on visual flight rules, and will “penetrate the arrival and departure airspace as defined by Transport Canada’s guidelines,” added Elwood. 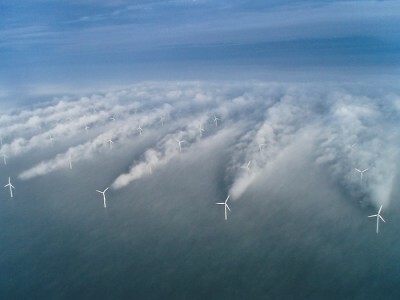 Eldwood warned that pilots could have trouble seeing the giant white turbine blades, especially in snowy, cloudy or rainy conditions, and said they produce strong wake turbulence that is invisible. Progressive Conservative house leader Jim Wilson said a gap in responsibility between the province, federal regulator Transport Canada and Nav Canada, which owns and operates the civil aviation service, means there are “no rules” on locating wind turbines near the two small airports. “A senior official with Nav Canada said one of the reasons they don’t have any real rules around this for these aerodromes is they didn’t think any government would be stupid enough to put 500-foot wind turbines near airports,” said Wilson. Environment Minister Glen Murray insisted there are no safety concerns with the wind turbines near the regional airports, and said opponents could appeal to an Environmental Review Tribunal hearing scheduled to start May 16 in Collingwood. “Nav Canada and Transport Canada — who are the experts, unlike myself and the member opposite — said there were no safety issues here that were at all material,” Murray told the legislature. Wpd said in a statement that aviation safety will not be affected by its project near the Collingwood airport, which it insisted meets all Transport Canada regulations. “Nav Canada has indicated on three separate occasions, including in March 2016, that it has no objections to the project,” said Wpd spokesman Kevin Surette. Charles Magwood of the residents’ group Preserve Clearview said it has spent over $1 million in the past several years fighting the wind project by Wpd Canada. In addition to the safety concerns, Magwood said there are fears the wind turbines will “tarnish” the Georgian Bay region’s excellent reputation with tourists. “They will be very surprised if, at the entrance into this tourist area, they’re going to find themselves moving through a gateway of industrial turbines,” he said. An economic impact study of the Wpd project found it would have a significant negative impact on the Collingwood airport and had the potential to jeopardize any future investment in the airport and the economy of the entire region. Wilson also pointed out that Wpd made regular contributions to the Liberal party as the project was going through the approval’s process, but gave nothing to the other parties. Jim Wilson and a busload of more than 60 wind turbine opponents went to Queen’s Park In Toronto with guns blazing but were again stonewalled by the Minister of the Environment. Simcoe Grey MPP Jim Wilson presented a private members resolution to the house in hopes that the government would scrap the approval for wpd Canada’s project of erecting eight 500-foot-high industrial wind turbines within two kilometres of the Collingwood Regional Airport. “No local municipality would ever put 500-foot tall wind turbines within 2.1 nautical miles of the end of a runway, that’s about four seconds after you take off,” Wilson yelled across the house. The Ontario Green Energy Act (GEA) was introduced by the Liberal Government under Dalton McGuinty in 2009, and was intended to expand renewable energy production, encourage energy conservation and create green jobs for the province, while other criticism have been the high tariff rates and the overabundance of energy generated by the province. It has been a sore point for municipalities objecting to projects the communities felt were detrimental to their own zoning and planning. In a press conference at Queen’s Park, Clearview councillor and owner of an aerodrome close to the proposed site Kevin Elwood challenged the government’s position that NavCan, a privately run, not-for-profit corporation that owns and operates Canada’s civil air navigation system agrees that the turbines should not have an effect on air traffic either to his own aerodrome or the Collingwood Regional Airport stating that both facilities are uncertified and therefore outside of NavCan’s influence. Elwood says that there is a gap in legislation between provincial and federal guidelines concerning uncertified aerodromes and airports, that to this point has never been addressed, although challenged by pilot’s associations. Kevin Surette, representing wpd Canada, still challenges the concerns. The Township of Clearview was to have a court hearing concerning the economic impact of the project on the area in February, but the Ministry of the Environment (MOECC) approved the wind farm application the day before the township had their day in court. The Town of Collingwood, which is one of six appealants in the case before the ERT were advised that more than 100 appeals had been heard since the province’s Green Energy Act came into effect and only three had been able to force amendments to any project that were challenged. Along with Collingwood and Clearview Township, the County of Simcoe, Kevin Elwood, John Wiggins and the Preserve Clearview citizens group are all appealing the decision at the ERT Tribunal which begins May 16 at the Collingwood Curling Club. These and 14 witness will be presenting to the tribunal which is expected to run three weeks. Wilson’s private member resolution failed to change anyone’s mind across the house. In the meantime, wpd Canada says that they hope to begin site preparation work by the summer. The opponents of an approved wind turbine project in Clearview Township tried another stab to blow it off course and get the provincial government to put a halt to the plans. With a busload of local residents down for the day to sit in the public gallery, Simcoe-Grey MPP Jim Wilson put forward a private member’s resolution in the Ontario legislature on Thursday asking the Liberal government to cancel WPD Canada’s Fairview Wind project. The project would see eight 500-foot wind turbines constructed in an area north and south of County Road 91 west of Stayner, including two within 2.1 nautical miles of the Collingwood Regional Airport. The project’s Renewable Energy Application (REA) was approved in March by the Ministry of Environment and Climate Change (MOECC), but has since been appealed to the Environmental Review Tribunal. A hearing is scheduled to begin May 16. In presenting his motion, Wilson challenged the government to “do the right thing” and rescind the decision. The MPP’s presentation was preceded by a news conference in the Queen’s Park media studio with the MPP, Preserve Clearview’s Chuck Magwood, and local businessman, pilot and municipal councillor Kevin Elwood. Elwood and Magwood called on the provincial government to cancel the approvals based on pilot safety. Elwood said all eight turbines penetrate arrival and takeoff space for both the regional airport and his private aerodrome off County Road 91. WPD says the turbine locations present a minimal safety hazard to pilots, and in a statement issued Thursday, said the company has consulted with Transport Canada and NAV Canada. Under its REA, WPD is required to hire an independent aeronautical consultant to recommend mitigation measures that should be put in place to ensure aviation safety. Any recommendations are to be implemented 10 days prior to erecting the turbines. In Thursday’s Question Period, in response to Wilson, MOECC minister Glen Murray said both Transport Canada and NAV Canada had been consulted with on the project. ”Each and every time they said there were no safety issues here that were at all material,” he said. In an email to Simcoe.com, ministry spokesperson David Mullock emphasized WPD’s application “met the ministry’s stringent requirements” after a lengthy review process. “Ministry technical experts worked with the proponent and regulatory agencies to ensure any concerns about the proposed layout of turbines near the airport and an aerodrome were considered and meet all regulatory agency requirements to reduce any risk to aviation activities,” he stated. Mullock added NAV Canada accepted the WPD’s Land Use Clearance Form and stated that they do not object to the proposal as submitted provided their construction notification requirements are met. However, Elwood said Transport Canada rules only determine how an obstruction will be marked so it’s visible to pilots, while NAV Canada only assessed the safety risk as it pertained to instrument approaches, not visual approaches. 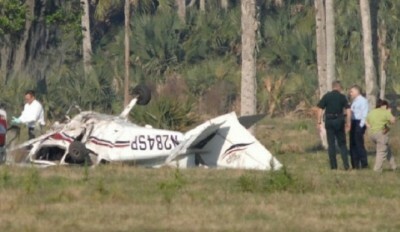 Wilson cited the example of a Piper aircraft that collided with a turbine in South Dakota in 2014, killing all four people aboard. In that case, it was determined the turbine’s obstruction lights were not functioning correctly. “These tragedies can happen,” he said. “Does this province want to have the first government with blood on its hands after they cause the first turbine-aircraft crash in Canada? The province is knowingly approving turbines that are a hazard,” Elwood said. “What is Premier Wynne going to say to the people of this province when the inevitable happens? What will she say when she has to stand up in the Legislature and explain why a plane collided with a wind turbine? Magwood said his group has spent about $1 million fighting the turbines. “We’re going to fight that fight to the bitter end, but the odds are stacked hugely against us,” he said. “The obligation falls to this government right now. We can’t look anywhere else. Couple of thoughts, , one , drones and agriculture will be huge in the near future, going off how much planes are pushed around by these things will using drones be impossible. Secondly, a while ago l heard a whisper and commented about a whistle blower from within the wind industry, l haven’t heard anything more to date ., he apparently said his company was using technology to adjust the turbines so whenever they where being tested for noise they ran within the guidelines ,, pretty much the same as Volkswagon where up to. Wondering if anyone else had heard anything about it..?